Acupuncture has been used for thousands of years in animals. Most of the literature dealing with veterinary acupuncture comes from China and other Asian countries where it has been more widely accepted as a valid method of treatment. It has only been in the last 50 years or so that acupuncture is becoming accepted in the United States, and has only been in the last 10-20 years that there has been an increasing interest and scientific acceptance within the veterinary medical community. Dr. Tarrant received his certification in Veterinary Acupuncture in 2006 from the International Veterinary Acupuncture Society. He has utilized acupuncture to treat many conditions; including back pain, urinary incontinence, behavior issues, allergies, chronic ear infections and hip dysplasia. Acupuncture principles are based on the flow of energy, or Qi (pronounced chee), through meridians covering the entire body to maintain a balance between Yin and Yang which are equal and opposite forces (i.e. light/dark, hot/cold, etc.). When these two forces are in balance, the body is said to be healthy. If there is an imbalance in these two forces, there will be some kind of disease. For the more scientific minded people, most acupuncture points are located near nerves or neurovascular bundles. These are areas where arteries, veins and nerves come close to the skin. By inserting a needle close to this point, the nervous system is stimulated to change to way signals are perceived or processed by the brain. There are also numerous studies that show acupuncture effects the release of hundreds of different hormones, changes blood flow, changes blood pressure, decreases inflammation, changes serotonin, dopamine and other neurotransmitter levels and many other physiologic changes in the body. Scientifically based acupuncturists term these kinds of changes neuromodulation. 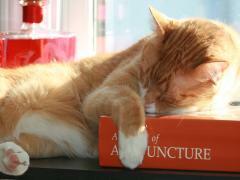 Why Get Acupuncture For Your Animal? While it is not a “magic bullet”, acupuncture is often a helpful tool in the management of many conditions such as arthritis, hip dysplasia, back pain, skin problems, chronic eye and ear problems, vomiting, diarrhea, seizures, urinary incontinence, and endocrine diseases such as diabetes and hypothyroidism to name a few. Some conditions can be treated solely with acupuncture, but more often it is used in combination with other herbal formulas, medications and treatments. When used in conjunction with other treatments we can often times decrease the amount of medication that the pet is taking or totally take them off of medicine after treatment with acupuncture. For example, a dog that is taking anti-inflammatory drugs for hip dysplasia or arthritis may be able to decrease their dose from 100mg a day to 50mg a day, or just take the drugs as needed instead of every day. It is often a great alternative to invasive, painful or costly procedures. Animals tolerate acupuncture amazingly well. Most of the animals will allow needling without any problems (or sedation) and many will even relax to the point that they fall asleep with the needles in place. A typical treatment will last from 10-30 minutes depending on the condition being treated and the animal’s tolerance for the needles. Owners will typically see some response within the first 2-5 treatments, with an increase in the length of response between each treatment. Most of the time we begin treating animals weekly or bi-weekly until the desired effect is seen and then lengthen the time between each treatment until we reach a maintenance schedule which is typically every 1-4 months. A typical treatment protocol consists of 5-10 treatments. Chinese herbal medicine has been around for thousands of years just like acupuncture. Both are branches of Chinese medicine along with various massage techniques and martial arts such as Qi Gong. When added together in a formula, the individual herbs may help strengthen the action of another or help to decrease any potential toxic or unwanted side effects. Now the herbs are mixed together in specific herbal formulas designed to treat almost any type of disease. As we make progress and advancements in medical research, there is a mounting body of evidence to show the effectiveness of Chinese herbal medicine in the treatment of disease. We use herbal formulas to treat many different things including cancer, allergies, skin diseases and infections, behavior problems, and gastrointestinal diseases. The herbal formulas are usually part of a comprehensive plan to address both the immediate needs of the patient to provide relief of their symptoms and to also address the primary cause and prevent the problem from returning. Chinese herbal formulas are considered very safe as long as they are used correctly. The ‘herbs’ consist of many different things, the bulk of which are plant leaves, stems, roots, bark and fruits but can also contain animal parts, insects or minerals. Historically, there have been parts from endangered animals but with modern medicine and the ethical principles of Chinese medical practitioners along with conservation efforts to protect threatened or endangered species of plants and animals, these traditional ingredients are now substituted with commonly found species. Many of the plant species are now available commercially and specifically grown for use in modern herbal medicine. Herbal formulas and the Chinese diagnostic systems are based on several different methods that do not seem to correlate with our western medical systems until you look a little deeper. For example, let us look at a ‘hot spot’ which is a superficial skin infection that usually occurs secondary to allergies and scratching or chewing at a particular spot. In Chinese medicine, this would be diagnosed as ‘damp heat’ and a formula to clear the damp heat such as Long Dan Xie Gan Tang would be used. Formulas such as this have been found through modern studies to contain both anti-inflammatory and antibiotic properties. This is very similar to the treatment that would be prescribed in western medicine that would consist of an anti-inflammatory such as hydrocortisone and an antibiotic for the infection. There are many other examples showing that traditional Chinese herbal formulas have a medical basis in modern medicine. One of the best things about herbal medicine is that the formulas are safe when used correctly and many times the side effects found with modern pharmaceuticals can be avoided while still achieving very good results.